INTERNATIONAL SHIPPING: Weight/Size: Shipping outside the U.S. on multiple heavy/large items may require additional shipping cost, due to weight/size (billed separately from your order). E-mail us with your shipping address, and desired quantity, if you need a shipping quote. Standard size ball used in most makes and models. Used in most flipper pinball machines, and some bingo pinballs. Replaces Alvin G. # BAL-001, Bally M-168-26, Brunswick 55-860164-000, Capcom BL00103, Chicago Coin 6717-C, Gottlieb 21864 MH31, Midway 0017-00009-0546, Stern 6717-C & 260-5000-00, Williams 20-6500 & 20A-6500. Replace those scratched, chipped, and cloudy-looking old balls with shiny new ones! If you cant see your clear reflection in the ball, its time to replace! 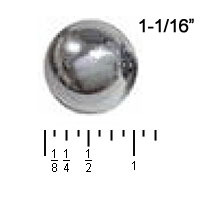 Worn balls will cause premature wear to your playfield surface and parts! Make balls a regular replacement item for your game. NOTE: Most new balls we sell have a light film of oil on them to prevent rust- clean with soft cloth before placing in your game.